The best website designs should significantly increase online customer leads, internet sales, and drive more engagement to your hotel or other business. Our Chiang Mai web development service will generate more organic visitors to your page and still be aesthetically beautiful in the page design. Ace Marketing solutions is proud to build modern websites which are fully mobile optimized and allow easy access for navigating between the network of pages. We offer a variety of packages to develop the competitiveness of your business in Chiang Mai within your individual industry, whether it’s a hotel, restaurant or other business. 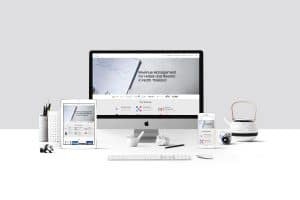 In addition to website development we offer various Facebook, Twitter, Instagram and other social media packages to increase the online awareness and promote your business in Chiang Mai and Thailand. All of our webpages are mobile responsive for an optimal viewing experience. Our Chiang Mai programmers specialize in many areas of website building, which includes WordPress, SEO, graphic design, HTML and of course CSS. These online programming skills enables us to custom build your website to match your companies theme and marketing strategy to maximize sales growth from the desired target audience. Ace Marketing Solutions can build WordPress templates or other webpages in English, Thai and also Chinese language as required. All site content and key words are planned and written to boost the highest visibility within the best search engine results pages such as Google, Yahoo and Bing. The Search Engine Optimization (SEO) strategy our team use when developing the pages will ensure there is an organic flow of natural customers who are driven directly to your website when searching for local services in Chiang Mai, Thailand. We still believe that site content is king, and will ensure all written page text outlines the benefits to your target audience, whether it’s a local or global company. 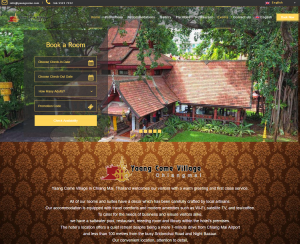 The Website for Yaang Come Village in Chiang Mai, which was designed and custom built by Ace Marketing Solutions. The Ace Marketing Solutions team will make the whole web development process easy, to consume as little time from your business as possible to build your fluently written SEO optimized page. The registering and transferring of data, multimedia and existing site content between domains or hosting will all be done by our in house website design team. Is your Chiang Mai based business looking to build or redevelop your current site? Contact Ace Marketing Solutions today by email, Facebook Messenger or through our online contact form to discuss developing a successful new website for your company.